Zither (pronounced /ˈzɪ.ðər/ or /ˈzɪ.θər/, German: [ˈtsɪtɐ]) is a class of stringed instruments. The word zither is a German rendering of the Latin word cithara, from which the modern word "guitar" also derives. Historically, it has been applied to any instrument of the cittern family, or an instrument consisting of many strings stretched across a thin, flat body – similar to a psaltery. This article describes the second variety. Zithers are played by strumming or plucking the strings, either with the fingers (sometimes using an accessory called a plectrum or pick), sounding the strings with a bow, or, with varieties of the instrument like the santur or cimbalom, by beating the strings with specially shaped hammers. Like a guitar or lute, a zither's body serves as a resonating chamber (sound box), but, unlike guitars and lutes, a zither lacks a distinctly separate neck assembly. The number of strings varies, from one to more than fifty. In modern common usage the term "zither" refers to three specific instruments: the concert zither (German: Konzertzither), its variant the Alpine zither (both using a fretted fingerboard), and the chord zither (more recently described as a fretless zither). Concert and Alpine zithers are traditionally found in Slovenia, Austria, Hungary, France, north-western Croatia, the southern regions of Germany and alpine Europe. Emigration from these areas during the 19th century introduced the concert and Alpine zither to North and South America. Chord zithers similar to the instrument in the photograph also became popular in North America during the late 19th and early 20th century. These variants all use metal strings, similar to the cittern. The word 'zither' is derived from Latin cythara, which was used in this form for the title covers on many 16th and 17th century German printed manuscript books originally for the 'cittern' – from the Greek word kithara, an instrument used in Ancient Greece. The German scholar Michael Praetorius described a small English cittern as a Klein Englisch Zitterlein in his treatise Syntagma Musicum, published during the early 17th century, recording the language consonant shift. It is not fully understood how 'zitter' or 'zither' came to be applied to the instruments in this article as well as German varieties of the cittern. Other types of zither also existed in Germany, mostly drone zithers like the scheitholt (which was mentioned by Praetorius) or hummel, but these generally have their own individual regional names and may have been in use before the introduction into the lexicon of 'cythara' and its German derivative cognate. The Hornbostel-Sachs system, an academic instrument classification method, also uses the term zither, to classify all stringed instruments in which the strings do not extend beyond the sounding box. This includes such diverse instruments as the hammered dulcimer, psaltery, Appalachian dulcimer, guqin, guzheng , tromba marina, koto, gusli, kantele, valiha, gayageum, đàn tranh, kanun, autoharp, santoor, yangqin, santur, swarmandal, and others. Pedal steel guitars, lap guitars (where the neck serves no separate function other than to extend the string length), and keyboard instruments like the clavichord, harpsichord and piano also fall within this broad categorical use. The word has also been used in conjunction with brand varieties of other string instruments, for example the zither banjo. The earliest known surviving instrument of the zither family is a Chinese guqin, a fretless instrument, found in the tomb of Marquis Yi of Zeng dating from 433 BC. Similar instruments along this design were developed over the following centuries, for example: the Japanese silk strung koto, the siter of Indonesian gamelans; the Qānūn (or Kanun) of the Middle East; the valiha, a tube zither of Madagascar; and many others. Increasing interest in 'world music' has brought wider recognition to these other zither family members, both ancient and modern. Many of these instruments have been sampled electronically, and are available in instrument banks for music synthesizers. In Europe and other more northern and western regions, early zithers were more similar to the modern mountain dulcimer, having long, usually rectangular, sound boxes, with one or more melody strings and several unfretted drone strings. Some of these employed movable bridges similar to the Japanese koto, used for retuning the drone strings. The Alpine Scheitholt furnishes an example of this older type of European zither. 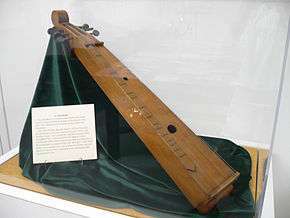 By the late 18th century, two principal varieties of European concert zither had developed, known as the Salzburg zither (with a rounded side away from the player), and the Mittenwald zither (with both sides rounded). Both styles are still found in concert zithers today, although the Salzburg style has become by far the most common. 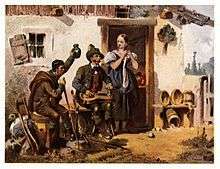 The zither became a popular folk music instrument in Bavaria and Austria and, at the beginning of the 19th century, was known as a Volkszither. Viennese zitherist Johann Petzmayer (1803–1884) became one of the outstanding virtuosi on these early instruments, and is credited with making the zither a household instrument. In 1838, Nikolaus Weigel of Munich conceived the idea of adopting fixed bridges, adding additional strings, tuning them in the cycle of fifths, and chromatically fretting the fingerboard – effectively converting a rather crude folk instrument into the concert zither. His ideas were not, however, widely accepted until 1862, when luthier Max Amberger of Munich fabricated a new zither based on Weigel's design. At this point the zither had reached something very close to its modern concert form. Within a relatively short time the new design had largely replaced the old Volkszither (though still called by the same name among folk musicians) throughout central Europe, particularly in the Alpine countries. As the 'concert zither' it also began to attract the attention of serious composers, a number of whom, themselves, became concert zither virtuosi. These composers, called the "altmeister", flourished between 1870 and 1910. And no less a composer than Johann Strauss II gave the instrument a prominent solo in one of his most famous waltzes, "Tales from the Vienna Woods". The zither went through two periods of great popularity in the United States. The first of these was in the late 19th through early 20th century, when it was greatly in vogue as a parlour instrument in many homes. During that period, a number of U.S.-based instrument manufacturers, many of them founded by, or staffed with, European (and especially German and Austrian) luthiers, were producing concert zithers. Chord zithers were often marketed under confusing brand names like 'guitar zither' or 'mandoline zither'. The recently rediscovered recordings of the gospel singer Washington Phillips, who used two instruments simultaneously, have revealed the virtuosic capability of the chord zither to modern musicians seeking to revive it. By the 1920s, this popularity had begun to wane, as other string instruments (notably guitars) increased in popularity along with the new fashion for jazz music. In the 1950s, interest in zithers resurfaced due in great measure to the success of the 1949 British film noir The Third Man. The soundtrack music for the film, which featured only a concert zither (no other instruments) – was performed by the Viennese musician Anton Karas. His "The Third Man Theme" was released as a single in 1949–50 and became a best-seller in the UK. Following its release in the U.S. in 1950, it spent eleven weeks at number one on Billboard's U.S. Best Sellers in Stores Chart from 29 April to 8 July. The exposure made Karas an international star. A Time magazine film preview stated that "the famous musical score by Anton Karas" would have the audience "in a dither with his zither". This new popularity for the zither lasted until well into the 1960s with many successful albums during the period from performers such as Karas, Ruth Welcome, and Shirley Abicair. German-born American Ruth Welcome released a number of very popular theme-based zither albums between 1958 and 1965 (e.g., Romantic Zither; Zither South of the Border; Zither Goes to Hollywood). Australian-born singer Shirley Abicair popularised the chord zither when she used it for accompaniment in her TV shows, live performances and recordings in Britain in the 1950s and '60s. Zither music also featured in a Twilight Zone episode – Mr Bevis in 1960. 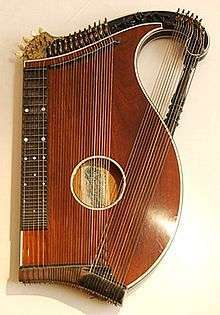 A concert zither may have from 29 to 38 strings, with 34 or 35 being most typical. These are arranged as follows: four or five fretted melody strings, placed above a guitar-like fretboard; 12 unfretted "accompaniment" strings; followed by 12 unfretted "bass" strings; a varying number of "contrabass" strings, with five or six being the most common number. On some older zithers, one may find "half-frets" above the 12th fret, which extend only under the first two or three strings. This results in the lower fretted strings having no pitches available above the 12th fret, while the higher fretted strings still have higher chromatic pitches available at these half-frets. Nearly all instruments made after 1960, however, have full-length frets all the way up the fretboard. Anton Karas and Ruth Welcome used instruments of similar design to the one illustrated. After World War II, Karas (according to zither scholar Günter Wittenstein, who was acquainted with him) performed on an instrument of larger dimensions than normal – with a 43 cm standard scale length for the fingerboard strings. He used Viennese tuning (see below), but with an altered chromatic sequence for the fingerboard and open strings. The accompaniment strings g and f# were tuned an octave higher, while contrabass strings tuned eb, f, d, e, c# replaced the regular cycle of fifths bass strings. This brought the contrabasses closer to the fingerboard where the player could reach them more easily. For the The Third Man, Karas tuned the zither a semi-tone lower, giving a particularly distinctive tone to the contrabass strings. The resulting lower string tension also enabled Karas to perform an expressive vibrato on the fingerboard melody strings. Film director Carol Reed, (on whose oak kitchen table the music was performed), described the sound as "gritty and dirty", perfectly reflecting the atmospheric mood of the film. The Alpine zither has 42 strings, and differs from the concert zither primarily in requiring the addition of an extension to the body of the instrument to support both the longer additional contrabass strings and their tuners. Alpine zithers are tuned in a similar manner to the concert zither, with the accompaniment and bass strings each providing a full set of 12 chromatic pitches also arranged in a cycle of fifths. Contrabass strings are arranged in a descending chromatic scale. Late 19th and early 20th century versions of the instrument were often called 'harp zithers' – so-named because the pillar extension seemed a miniature version of the harp's pillar. The extra contrabass strings ran parallel to the other strings on these earlier instruments, the diagonal arrangement illustrated developed later to assist the right hand in reaching the strings. There are two popular tunings for the modern zither: Munich and Viennese. The "zither tuning chart" below, gives tuning details, including pitches and octaves. Munich tuning is on top, and Vienna tuning below. Some players have used Vienna tuning only for the fretted strings, and Munich tuning for the unfretted strings. Full Viennese tuning is normally used only on instruments with 38 or fewer strings. 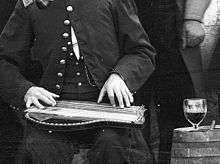 The zither is played by plucking the strings while it lies flat on a table (which acts as a resonator to amplify the sound), or it can be held on the lap. On concert and Alpine zithers the melody strings are pressed to the fingerboard ("fretted") with the fingers of the left hand, and plucked with a plectrum on the right thumb. First and second fingers of the right hand pluck the accompaniment and bass strings, and the third finger of the right hand plucks the contrabass strings (there are variants on this technique). The concept of the chord zither is different from that of the concert and alpine zithers. These instruments may have from 12 to 50 (or more) strings, depending on design. All the strings are played open, in the manner of a harp. The strings on the left are arranged in groups of three or four, which form various chords to be played by the left hand. The strings to the right are single (or pairs of) strings intended for the right hand to pick out the melody. Tuning can vary widely from manufacturer to manufacturer and even from model to model, but is usually indicated on the instrument itself, in the form of a painted or paper chart glued under the strings. As an advanced technique was required to play anything more than simple tunes, the vast majority of the concert zithers sold never attained more than amateur or (mostly) ornamental use; the playing of Washington Phillips was a rare exception. Manufacturers attempted to simplify the instrument with various keyboard devices attached to the melody strings (Marxophone, dolceola, celestaphone, tremoloa, etc. ), but the invention of the autoharp is probably the most successful adaptation. This uses bars (with felt pads attached underneath) placed across and above the strings. Springs raise the pads from all bars free of the strings. Each bar has a button that indicates a chord, with pads arranged so that they mute all strings not in the chord when the player presses the button or bar. Simply depressing the button with one finger stops unwanted strings from sounding as the mutes under the bars contact them. Note, however, that the absence of a fretboard makes the autoharp a closer relative of the chord zither, than of the concert zither. Presence of the concert zither in classical music remains sparse. Concert and Alpine zithers remain in use by a relatively small number of contemporary musicians from various global regions and musical genres, either out of interest in traditional musical styles for the instrument, or from a desire to seek new sounds for their music. New variations on the concert zither have also been employed, including the electric zither—and recent instruments that share zither characteristics, such as the Chapman stick. While use of the concert zither itself has declined, zither music and technique continued to influence contemporary musicians. 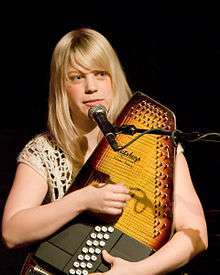 For example: Canadian musician Jeff Healey, featured in the film thriller Road House in 1989 used a zither technique to play electric guitar. Blind from the age of one, Healey began playing when he was three with the instrument flat on his lap, left hand above the fingerboard in the same manner as a zitherist. Although he used a Fender Stratocaster guitar throughout his career, the instrument was in effect being used as an electric zither. 1 2 "zither". Oxford Dictionaries Online. Oxford University Press. 2013. Retrieved 2013-10-26. ↑ "Strings on a table". Merriam-Webster.com. Merriam-Webster. 2013. Retrieved 2013-10-26. ↑ "zither". Dictionary.com Unabridged. Random House, Inc. 2013. Retrieved 2013-10-26. ↑ Stephen Jones. "Source and stream: early music and living traditions in China" (PDF). Oxford Journals. 1 2 "History". www.zithers-usa.com. Archived from the original on March 3, 2016. Retrieved 6 June 2016. ↑ The part is sometimes played on a mandolin, when a zither is not available. ↑ "Song title 199 - Third Man Theme". Tsort.info. 2007-10-08. Retrieved 2013-06-24. ↑ "The Third Man" DVD review, Sean Axmaker, Turner Classic Movies. ↑ The Ultimate Trailer Show. HDNet, 22 September 2010. ↑ Fitzpatrick, Rob (4 September 2013). "The 101 strangest records on Spotify: Ruth Welcome – Romantic Zither". Retrieved 6 June 2016. ↑ "Ruth Welcome". Retrieved 6 June 2016. ↑ "The Twilight Zone (1959) s01e33 Episode Script - SS". Retrieved 6 June 2016. Wikimedia Commons has media related to Zithers. Wikisource has the text of the 1911 Encyclopædia Britannica article Zither. "Fretless Zithers" at MinerMusic.com English language site dedicated to the chord zither. The authors present arguments for the instrument to be renamed 'fretless zither'. Contains some dead links. "Zither US" English language site based in the U.S.A.. Contains biographies of early performers and personalities associated with the history of concert and Alpine zithers, mainly in the U.S. Also contacts for resources like instrument maintenance, enthusiast clubs and events.